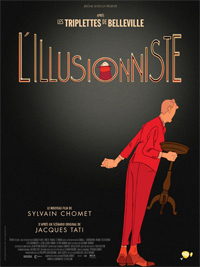 The Illusionist is a French animated film directed by Sylvain Chomet, based on an unproduced script that Jacques Tati wrote back in the 1950’s. He reportedly wrote it as a “personal letter” to an estranged daughter. It tells the story of an unsuccessful stage magician who goes on a tour of Britain. In a small town in Scotland, he meets a young girl, Alice, who believes he actually possesses magical powers. She runs away from the town and follows him to Edinburgh, where they develop a father/daughter relationship. Anyone who has seen a Tati film will recognize his approach in this movie: understated comedy with moments of pathos. There is very little dialogue. The main character is a well-intentioned, but hapless, outsider who can never quite fit in wherever he goes. This film is beautifully animated. There is a scene of Edinburgh seen from above that I found just breath-taking. Overall, I found this film enchanting and subtly moving. This entry was posted on February 6, 2011 at 6:48 am and is filed under Cinema. You can follow any responses to this entry through the RSS 2.0 feed. You can leave a response, or trackback from your own site.